As a big fan of the board game Taboo (oh god, I've outed myself), I was pretty jealous of a segment on last night's Tonight Show. Guests Lena Dunham and Hugh Dancy played Pyramid along with host Jimmy Fallon and The Roots' Questlove. 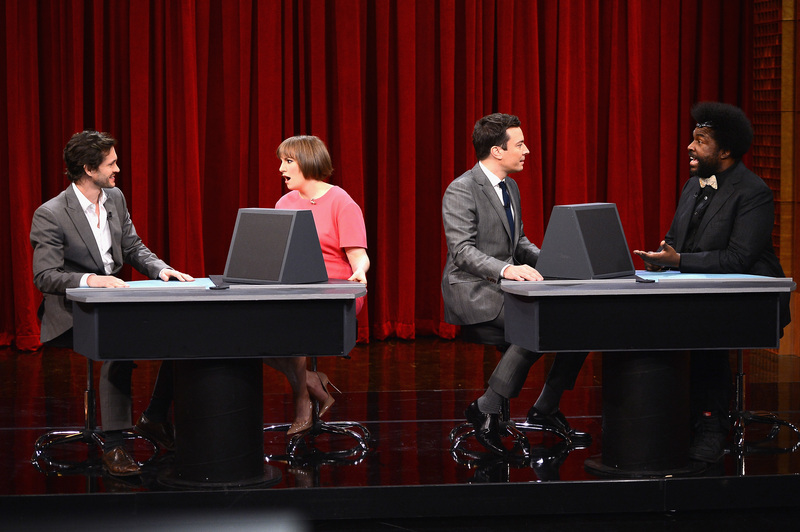 Dunham and Dancy made for a strong team while Fallon and Questlove came together in an attempt to win at home. If you aren't familiar with Pyramid — and how is that possible? — it was a long-running game show where contestants had to pair up to make each other guess words without saying the actual word. This leads to funny situations where the questioner accidentally blurts out the word and everyone laughs because "Hahaha! What a fool! What wholesome hilarity!" Highlights of The Tonight Show's Pyramid game include Dunham hinting at "Fight Club" by saying, "I'm gonna punch you in the face and no one else can know about it... I'm Edwards Norton!" and Fallon trying to get Questlove to say "secret" by singing, "My baby's got a..." to which Questlove blurts out "back." In his defense, "Baby Got Back" is a much more popular song. This feels like telling a "You really just had to be there story," so just watch the game for yourself. Be sure to look out for Questlove becoming overwhelmed when "macaroni" pops up on the screen.